The attitudes and values of a country have a significant impact on the way that business is conducted. The following section will outline major themes in this area. In particular, it will deal with areas of Spanish culture that may influence the success of business negotiations. They usually do not put too much emphasis upon work, as they like to focus on their leisure and live each day to the fullest. In general, family and social bonds are more important than a person’s working life in Spain. It is crucial to realise this fact when conducting business with Spaniards, as this may help you to understand the point of view of your Spanish counterparts in various situations. Women wear skirts and blouses or dresses. Caps, bandannas, athletic shoes, sweats, unkempt clothes, jeans, singlets, open shoes and thongs are never acceptable. If the wind was blowing, comb your hair before making first contact at the reception. Do not carry a water bottle or coffee mug. Carry only a slim folder holding your job application documents and CVs. Do not chew anything. Spanish people are very conscious of personal presentation and will perceive your appearance as an indication of your professional achievement and relative social standing. Thus, it is important to dress in a manner that demonstrates professionalism, style and a serious approach to business. It is advisable to dress with elegance and use only top-quality materials in subdued colours. Designer clothes are particularly recommended and elegant accessories are important for both men and women. For men, dark woollen or linen suits and silk ties with white cotton shirts are recommended. As Spanish weather can be very hot, it is usually acceptable to wear lightweight suits, to loosen one’s tie and throw one’s jacket over one’s shoulder. If in doubt, simply follow the lead of your business host. Women should wear well-cut suits or dresses made of high-quality fabrics. In general, Spanish women are expected to avoid drawing attention to their physical sexuality and tend to express themselves through their immaculate clothes and hair. Unless you are visiting Spain as a tourist, it is best to avoid wearing shorts and dress conservatively in the cities. You should also be well covered if entering a church and dress up for the occasion, if dining out at a restaurant. Furthermore, high quality restaurants will have a formal dress code, even in hot summer months, such that T-shirts, cheap jeans and trainers are not acceptable attire. The mantilla is a type of veil piece that women wear for weddings. It is usually a light lace or silk scarf that is worn over the shoulders or head. A peineta, a very large comb, pairs with the mantilla, holding it in place. A peineta is a decorative piece, many times having a tortoiseshell color. A gilet is like a sleeveless jacket, which operates much like a vest, and it typically operates as part of an overall outfit. In the 19th century, gilets were used as dress bodices. Today, Spaniards refer to a gilet as a chaleco. There are many other kinds of traditional Spanish garments. Bullfighter costumes are flamboyant and decorative, a custom of 18th century Andalusian clothing. These suits have detailed embroidery and lavish designs, and Spaniards refer to them as traje de luces, or "suits of lights." 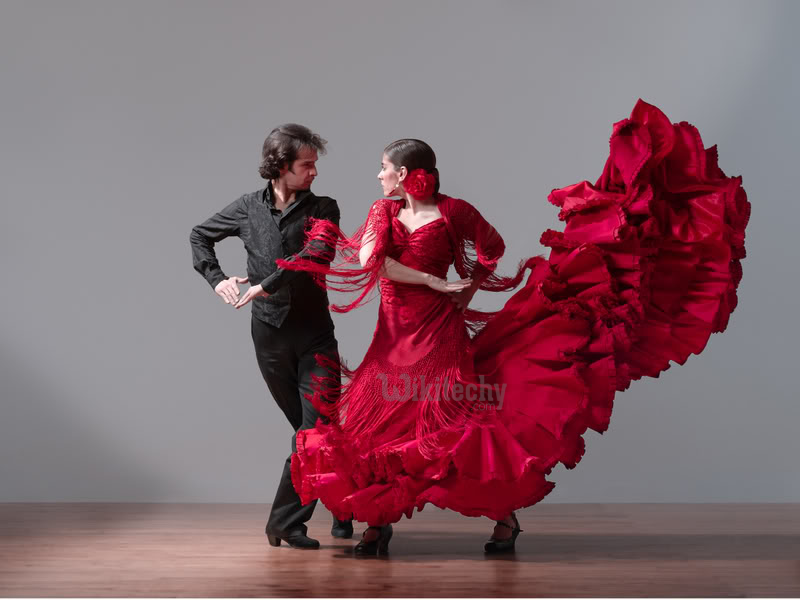 There are also flamenco dresses and tuxedos that performers still wear today. Fashion in Spain is an eclectic blend of traditional Spanish and contemporary Western style. Traditional Spanish attire was known its elegance and multicolored decoration. The fabrics were rich and embellished with metallic thread and jewels. Today's Spanish clothes are still colorful but with more of a Western flair for everyday wear. However, festivals, bullfights and ceremonies still call for traditional clothing. Spanish fabrics consist of mostly cotton, wool and fine leather. Tailors in Spain are known for putting attention into detail and craftsmanship. dress shoes or athletic shoes. Boots are popular for men and women. are popular in high-end boutiques. The fact that they hold fast to tradition and their refusal to constantly change with the times has kept them from becoming a fashion mecca. For traditional religious celebrations, Spanish women often wear a lace scarf, or mantilla. This serves as a veil. A large comb, or Peineta, holds the hair in place and secures the mantilla. The Gilet is a vest-like jacket that can be any length, from the waist to the knee. These were originally embroidered, but they have become less ornate over the years. women generally wear black or red-ruffled dresses and heels. Men wear matching tuxedo shirts and pants that allow freedom of movement. Light and loose cotton tops, pants and skirts are ideal for summers in Spain. With the hot summer sun, a cap, scarf or hat is often worn on the head. Winters in Spain can be quite cold. To protect from the harsh weather that is often windy, insulated coats and gloves are necessary. Most Spanish people dress like other Europeans during the day. However, they tend to dress up more in the evenings, often in formal wear for dinner out or a night on the town. In general the Spanish have a very modern outlook on clothing. They are keen on designer clothes but quality is more important than a designer name. Spanish made clothes tend to be high quality and reasonably priced. Teenage girls tend to wear trousers more than skirts. Denim is definitely 'in'. Teenage boys are keen on designer wear and appearance is important to them. Mature Spaniards dress conservatively and with style. Older men in particular tend to wear high quality clothing. It is unclear what the Spanish think of scantily clad holiday-makers but it is not acceptable in small villages, away from the coast. One should be particularly careful of dress code if entering churches. Swim-wear and short skirts are frowned upon. Girls who wear mini-skirts and bikini tops will be frowned upon and will certainly attract unwanted attention. Long dresses or skirts are fine, as are trousers. The Spanish really care about their personal appearance and image and on the whole they dress conservatively and make an effort when they go out, even if it's just doing the daily shopping. Jeans are very popular here in every style and worn throughout the year and will serve as a versatile base to your wardrobe. Wear them with cool layers such as camisoles or a t-shirt and light cardigan for the summer, or warmer ones e.g. a long sleeved shirt and sweater in the winter. Church is still an integral part of Spanish life and wearing shorts or being scantily dressed while visiting a church will not be appreciated. Spring and Fall are cooler and dressing in layers will help you cope with the temperature changes. Clever layering is the key to dressing for changeable weather. In the evening, local women dress more stylishly, particularly when dining out. If you are going to an average to high quality restaurant, you'll be more comfortable wearing something more dressy. Our advice would be to save your shorts and sarong for the beach; wearing them elsewhere will label you as a tourist and skimpy or tight fitting clothes may result in unwanted attention. If you're going to visit any religious sites then be sure to cover your shoulders and bare legs - a pashmina can come in handy for this. If you are going to Spain for business then pack your work clothes - Spanish women wear dresses or skirts. For business men will be expected to wear jackets and ties, even if it's hot.